I’ve been nominated for a what? That was my general feeling as I read through this recent post over at Lattes and Llamas. Well, that’s not entirely true. My first reaction was more like, ‘Whaaaat…is a Liebster?’ I then began some quick online searches. Once I knew a bit more about it there was definitely a victory dance involved. Or two. The bearded fellow got a kick out of it. But wait, there’s more. Since Jac and Megan-Anne were nominated for the Liebster and the Very Inspiring Blogger Award, they decided to mash the two into what they call: The Very Inspiring Liebster Blogger Award. Think of these awards as a way to give other blogs a virtual high-five and to welcome new bloggers (like me!) into the community. Let’s take a look at the rules. Nominate five other super cool blogs for the awards and notify them. Create ten questions for nominees to answer. First things first: Jac and Megan-Anne, thank you for reading, enjoying, and nominating my blog! Jac and Megan-Anne do wonderful things with charity knit-alongs, which they call Geek-A-Long. Their current project for a mystery blanket features a treasure trove of geek-themed imagery using spectacular double-knit designs. Even though I am not making the blanket, I drool over every square those two produce. Take a look! What is your go-to caffeinated beverage? Coffee or tea, depending on my mood. 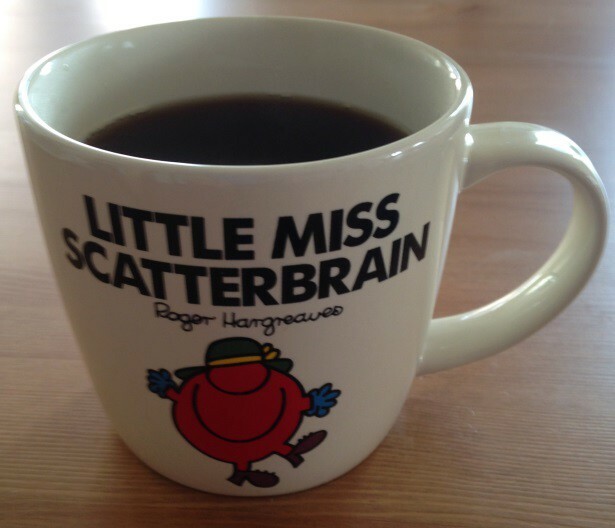 Just so long as it is in one of my favorite mugs. Ooh, tough one. Three minutes have just passed as I have pondered this question. Taking one look at the movies that the bearded fellow and I own, they are all cult classics. And we watch them over, and over, and over again, for different reasons. Conan is perfect background noise for craft days. Stargate and Big Trouble in Little China are infinitely quotable. Dark Crystal and Labyrinth for the puppets. Krull, Masters of the Universe and The Beastmaster are just…they just are. Alien, Metropolis, the list goes on. My ultimate favorite is Bladerunner. I cry every time Roy Batty tells Deckard about the attack ships on fire over the shoulder of Orion. Such a softie. What yarn related thing have you always wanted to try but haven’t gotten around to it yet? IE spinning, tatting, dying, Tunisian crochet, etc. Spinning! I have a Maine-made drop spindle that the bearded fellow found at Goodwill for all of three dollars, fleece included, that is holding a few yards of my first-ever hand spun yarn. I take it out every so often to remind myself just how uncoordinated I can be. What color are you in love with right now? Three Hearts and Three Lions, by Poul Anderson. If you could own any mythical creature as a pet, what would it be? My first reaction was dragon, but that would be a bit messy. My next choice is a Podling from The Dark Crystal. They look like potatoes and could teach me how not to kill plants. If your life was turned into a movie, what would it be titled? Here, There and Everywhere: The Universe is Calling. Winter. I know, crazy right? My thinking is, you can always put more layers on in winter but you can only take so much off in summer and it is still humid as all get out. 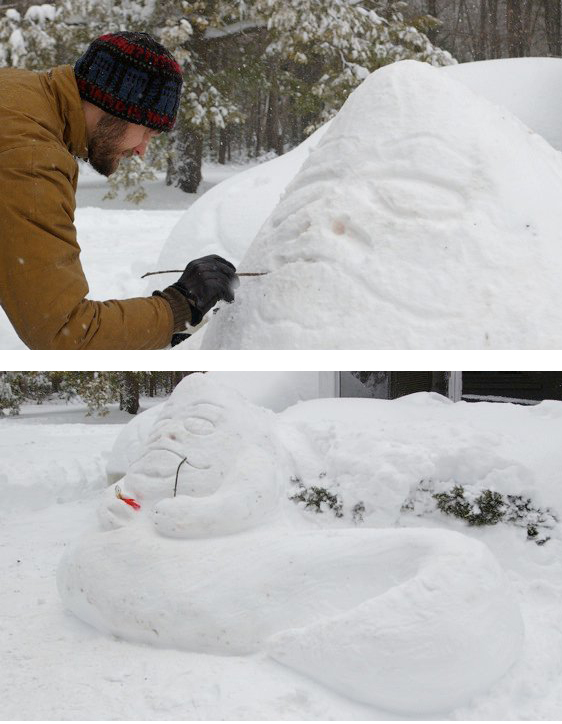 Also, you can spend snow days making things like Jabba the Snow Hutt. Why yes, that is a tiny spoon-shaped Leia (complete with slave Leia bikini) in the second picture. The bearded fellow keeping warm in his Tardis hat as he crafts the legendary Jabba the Snow Hutt. Note: I picked folks who, from what I could tell, had not received the award before. So many blogs, so little time. *B*A*M! crafts. She’s fun, she’s funky, she’s all geek all the time. Green Elephant Crochet & Things. She just started crocheting this year and has a real knack for color combinations, quirky projects and, in her words, things. Saltwater Hill Knits. Not only is she a native Mainer (whoop), her blog is a smooth blend of daily life and handy knitting tips. An Irish Knit Odyssey, for her daring quest to find, promote and use Irish-made yarn. The Brave Little Thread. She’s got an eye for photography and a way with words. Do you prefer eggs scrambled, fried or sunny side up? Would you rather sleep in or get up early? What is your most cherished finished object? If you could learn any new skill related to fiber arts, what would it be? Would you rather bake a cake or a pie? What book is next on your ‘to read’ list? I’m off to go notify my top five favorite blogs of their new celebrity status. Thanks again to Lattes and Llamas for the nomination and to everyone here for reading along!